We have been in Reno, Nevada at the National Cutting Horse Association's Western National Championships for about a week and a half so be ready for Reno posts! 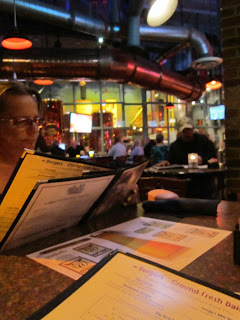 We got to Reno after our ten hour drive with hungry stomachs so we walked into Brew Brothers in the El Dorado Casino. We told the waitress to bring us the appetizer that could be made up the fastest - The wings came out and we devoured them. They were not particularly great but did the job just fine. Calories! We needed them. I ordered the Fish and Chips, of course. They were excellent. Light crispy breading, fried up to perfection. The fries were seasoned extra heavy, I am not sure if it was on purpose but it sure went well with the beer we were consuming. 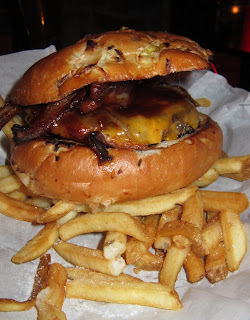 Scott got a BBQ Bacon Cheeseburger and I know it hit the spot. We had been up since two that morning without a decent meal in our tummy so just about anything would be good. We returned to this restaurant another time during our visit and the second time was even better. The onion rings are outstanding as well as the lemon Drops! Who would have thought in a brew house? !